First of all, I have to say – see this film. Far too few people know the story of Hypatia, the woman portrayed in it, whose death marked the downfall of Classical antiquity philosophizing. The underlying core of Agora is conflict – conflict between Christianity and Judaism and the pagan religions of Roman Egypt, conflict between right and wrong, and conflict between philosophy and love. Agora is based off of true events. It is the story of the latter end of the life of Hypatia, an Alexandrian philosopher. It did a remarkable job in portraying the factual events of her life: both a mathematician and a philosopher, she lived in the city of Alexandria in the end of the 4th century/beginning of the 5th century CE. She taught as the head of the Platonist school and took in any pupil as a student, from pagans to Christians, and taught to them works from philosophers such as Plato, Plotinus, and Aristotle. One such student was Synesius, the later bishop of Cyrene. Her works – none of which have survived intact – included such things as treatises on mathematics and the workings of the heavenly bodies. Apparently, as was shown all too well in the film, Hypatia was at the center of the conflict between Orestes, the Prefect of Alexandria, and Cyril, the Christian Patriarch. This caused her to become a hated figure by the Christians of Alexandria and would lead to her violent death – far worse than that portrayed in the film – at the hands of a mob in March of 415 CE. Alright, since I am spearheading the compilation of the devotional anthology in honor of Hera, following is the call for submissions. I am sincerely hoping to get some of my readers to submit.. and all y’all know who you are *squinty eyes* LOL. Seriously please please submit! Call for submissions! 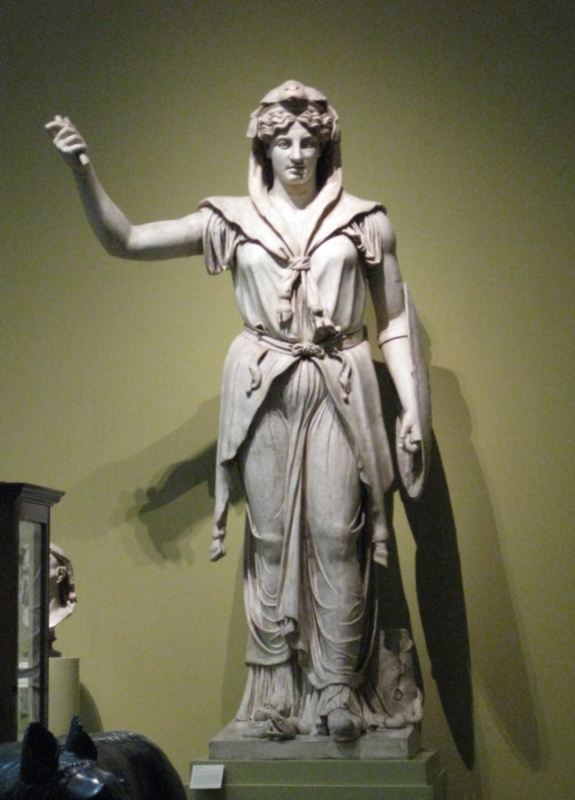 We are interested in a wide variety of pieces, including (but not limited to) scholarly articles, short fiction, poetry, original translations of ancient texts, hymns, rituals, recipes, and artwork that pertains to Hera, her Roman counterpart Iuno (Juno), and her Etruscan counterpart Uni. In either case, the deity whom I am referring to is the goddess of women, marriage, childbirth, matronly values, femininity, and the Roman people (back before Christianity gained power). She is the sister and wife of Iuppiter, the daughter of Saturnus, the mother of Vulcanus and Mars, and, along with Iuppiter and Minerva, held a position in the powerful Capitoline Triad. Statue of Iuno Sospita, dressed in her goatskin cloak. Her upraised hand probably held a spear. Like the other Roman deities, Iuno has many epithets. Three of her most well-known epithets are Moneta, Regina, and Sospita. In her role as Moneta, Iuno is called “The Warner” and is a protector of finances: she had a temple dedicated on the Capitoline hill where sacred geese were kept, because they had warned the people of an impending attack. In her role as Regina she is the Queen – the wife of Iuppiter and the Queen of the Gods. As Iuno Sospita she is the Savior, the defender and protector of her followers. Interestingly enough, she is often mentioned in vows and offerings together with Hercules, as both are seen as the protectors of newborns. The Kalends, the first day of every month, are sacred to Iuno. She is said to bring the first day of the month into existence with the help of Ianus, and is at this time invoked as Iuno Covella. Her sacred animals are the peacock and the goat (she is often depicted as dressed in a goatskin cloak), and her sacred foods are the fig and the pomegranate. In Virgil’s Aeneid, Iuno was very much an antagonist towards the titular hero, Aeneas. She did not like him, mainly for the reason that his descendants would found Rome, which would destroy Carthage, her favorite city. She spent much of the epic as a scheming, bitchy character who did everything in her power to make life difficult for Aeneas and his band of Trojans. Like with all literary portrayals of the gods, this is not how she should actually be seen. The tutelary deity for women takes its name from Iuno as well. While men have a sort of guardian deity known as the genius, women have a iuno. And it is not just mortal women who have this iuno: goddesses also do, if ancient inscriptions are any help. So, I recently saw a concert. It was, I’m kind of sad to say, the first concert that I have ever been to, and it was absolutely awesome to be so close to one of my favorite bands. Besides the fact that it was such a groovy experience, it got me thinking about music in the ancient world. Specifically, music in ancient Rome. Now, as much as I love the Romans, something must be said about their ingenuity. For all of their technology and culture and religion and the like, they were not an incredibly inventive bunch. The greatest influences on Roman music were the Etruscans and the Greeks, though with the expansion of the Empire the music would have changed to include African, Gallic, Germanic, and other Mediterranean styles. We know a lot less about ancient Roman music than we do ancient Greek music, because unfortunately not a lot of musical documents survived the ages (and Christianity as well, and that is no knock at that religion – the early Christians just didn’t like the ‘pagan’ Roman music). 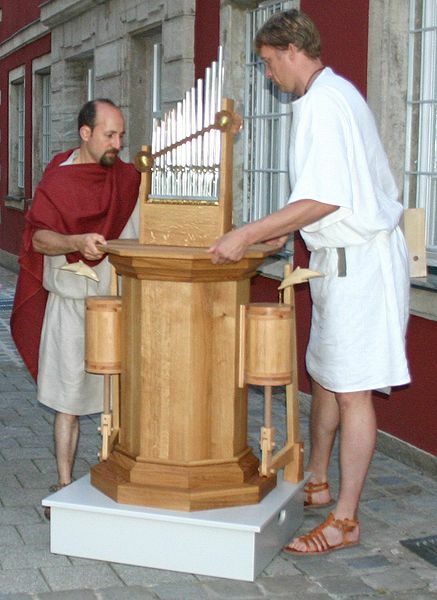 Apparently, what we do know – or assume – is that Roman music was monophonic (each piece being a single melody with no harmony) and followed an elaborate scale system. The only Roman source that we have comes from the 6th century CE musician and philosopher Boethius, and his writings are about Greek music rather than Roman. So, he’s not much help in this case. No written examples of music have been discovered as of yet, and it’s not likely that any will be found, if paintings of contemporary musicians are any clue – apparently, the Romans did not read sheet music. Music was used in a variety of situations and places, not only for religious purposes as some would think. Funerals, public and private gatherings, and gladiatorial spectacles all used music as well. There were even music recitals which people took place in, though they were typically not high-standing citizens, as such a thing may have been frowned upon – if you were a Roman male of free status, you did not dance or sing or play music in public. Generally. Someone neglected to tell that to the Emperor Nero, apparently. Tuba: this version of the tuba was not the modern version that we know, but instead something like a cross between a trumpet and a French horn. This was a long, straight bronze ordeal of Etruscan origin with a detachable mouthpiece. It was used by the military for ‘bugle calls’, and it was incapable of sounding different tones. 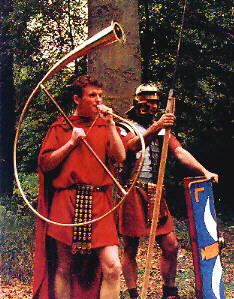 Cornu: a horn that is shaped like a capital G. Like the tuba, this was an Etruscan invention and was used in the military. Picture of a guy playing a replica cornu. Aulos/Tibia: the aulos is the Greek term, the tibia the Latin term. This instrument consisted of two unconnected reed pipes that sounded like a clarinet when blown. Askaules: an early bagpipe. This is somewhat contested, as not many depictions – whether literary or artistic – exist of this instrument. Cithara: like a lyre, but larger and heavier. The modern word ‘guitar’ apparently comes from this instrument. Lute: the forerunner of the cithara, this instrument had three strings and was supposedly easy to play. Hydraulis: AKA the water organ, this instrument is blown by air, and the power source for the air is water that has been compressed into pipes. The hydraulis was played by hand, and it featured keys which the operator would touch lightly. This instrument is the predecessor of the modern church organ. Fully functional replica of a hydraulis. Finally, I have some good news: there are several modern music groups who specialize in the reconstruction of ancient Roman music! Iuppiter sitting on his throne, looking “jovial” (lol). For those linguists and/or Hellenic polytheists out there who are reading this, you may recognize his name as extremely similar to that of the vocative Zeu Pater, or Father Zeus. This is no coincidence: both names apparently come from the Indo-European vocative Dyeu pater. And according to the 19th century philologist Georg Wissowa, Iuppiter’s name was originally Dieus-pater, which later got shortened to Diespiter. Iuppiter had his own priest, an important man called the flamen Dialis. The wife of this flamen was called the flaminica Dialis. There were some strange customs that the flamen Dialis had to follow: he could not remove his trademark pointy hat while outdoors, swear any oaths, or be absent from his bed for more than two nights in a row. The reason for the former was supposedly because he didn’t want to risk offending Iuppiter by appearing “naked” in the sight of the god. During the waning years of the Empire, however, the post of the flamen Dialis went unfilled: from approximately 86 BCE to 11 BCE the other pontifices, or priests, of Rome were responsible for performing the duties of this office. There are a few surviving myths of the King of the Gods as well. In one myth, Iuppiter is said to be the twin of Iuno and the son of Fortuna Primigenia (although there is another version of this myth that says that he is the father of Fortuna Primigenia). Later, when he became identified with the Greek god Zeus, he was seen as the brother of Neptunus and Pluto and the son of Saturnus. He was also seen as the equivalent of the Etruscan god Tinia. In another myth, he enters into a battle of wits with the second King of Rome, Numa Pompilius, resulting in the ancile – or angle-less – shield being dropped from the sky as a symbol of the power that the Romans would later hold. He later struck down Tullus Hostilius, the third King of Rome, after Tullus did not dutifully perform sacrifices, and gave the fifth King, Lucius Tarquinius Priscus, a sign that he would become King. The sacred animal of Iuppiter was the eagle. Because of this, the standards of the Roman army bore the eagle, and it was considered an unspeakable disgrace to lose one’s aquila, or eagle-standard, to the enemy. Animals that were sacrificed to Iuppiter were the castrated bull, lamb, and ram, and all of these victims were supposed to be white in color. Along with the sacred animal, Iuppiter had sacred days of the calendar. These included the Ides (the 13th or the 15th of the month) and the nundinae, or market days that occurred every 9th day. He had several feast-days as well, known as the epula Iovis. Iuppiter has many, many epithets – too many for me to list here without at best tripling the size of this post. Perhaps his most well known epithet is Optimus Maximus, or the Best and Greatest, and this role of Iuppiter had a temple on the Capitoline Hill. Today’s post is, as you can see, about the ancient Roman imperial cult(s). I’ve been wanting to do a post on this topic for a while (for several months now, anyway) but just haven’t gotten around to doing so. It’s not really a topic that I have any experience in, as I really don’t give offerings to the deified Emperors, but I understand that several modern-day Roman polytheists do. I suppose that the former isn’t exactly true: there have been one or two times when I have given an offering to a deified Emperor for some reason or another, but I don’t incorporate them into my religio like their contemporaries would have. Anyway, with that being said, this post will probably be more historical and less religious in nature. Imperial apotheosis – the process by which the deceased Emperor was said to have taken on god-like status – was, as the name suggests, not something that was practiced during the Roman Republic. …Well, alright, so it kind of was. 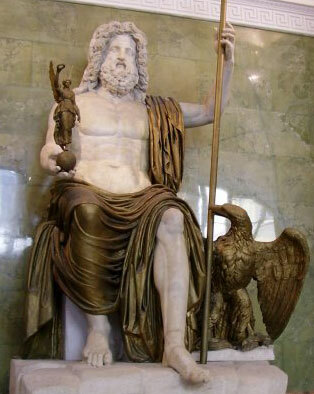 The Republican-era Romans worshipped several deities that were said to have been historical figures, mythical or not: the two most prominent were Quirinus and Iuppiter Indiges. The former was supposedly the deified Romulus (a theory that I don’t readily subscribe to, for several reasons…I sense a Quirinus-centered blog post in the near future! ), the latter the deified Aeneas. And for Romans of all periods of their history, the Dii Manes (“Divine Ancestral Spirits”, basically) were their very ancestors. There is really no evidence that the Kings of the archaic period and the Senators of the Republican period were deified to divus status upon death. But all that changed, however, with the collapse of the Republic and the rise of the Empire. The first Roman statesman to have been elevated to divus status was Iulius Caesar. He was hardly an Emperor; instead, he was seen as more of a dictator than anything. There is evidence that around 46 BCE the Senate attempted to declare that he was a living demi-god, but this didn’t go over too well with Caesar, who apparently didn’t want to make this claim. Again, after his victory in the civil war’s Battle of Munda in 45 BCE, he was declared a demi-god. This time, there is no evidence that he declined this title. He was awarded a lavish, temple-like house at public expense, his image was put onto coins (something unheard of for Roman men, at least), and he was called the “unconquered god” in the temple of Quirinus. Among many other things, his genius was publically worshipped and the month of July was named after him. When he was assassinated in 44 BCE, the cult of divus Iulius sprang up. This was followed by the appearance of a comet, which people interpreted as his soul flying around in the sky. He was officially apotheosized in 42 BCE by Augustus, whereby his cult was given a flamen, or priest. This tradition continued with the apotheosis of Augustus upon his death in 14 CE, though not all Roman Emperors were awarded this status upon their deaths, and some who were were ridiculed as unworthy. Augustus’ heir Tiberius was not deified, and neither were Caligula, Nero, and Domitian, among others. After Augustus, the more popular Emperors – at least, in the eyes of the Senate, who were responsible for the decree of apotheosis – that were deified were Claudius (though this decision was highly ridiculed, as seen in Seneca’s Apocolocyntosis Claudii, or the Pumpkinification of Claudius), Vespasian, Titus, Nerva, Trajan, Hadrian (whose case had to be pleaded by his successor Antoninus Pius), etc. 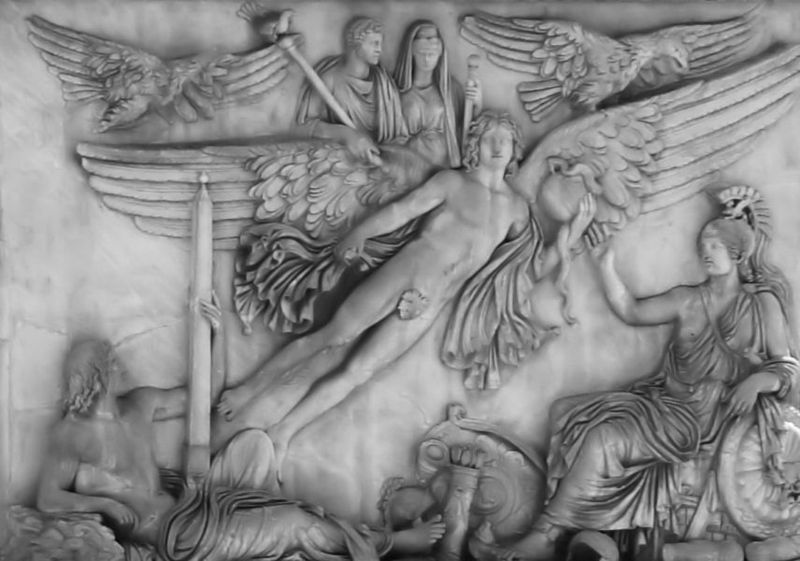 Apotheosis of Antoninus Pius and his wife Faustina, both carried on the back of a winged genius. I probably didn’t cover everything in this post; I may or may not follow this up with a part 2. As with all other posts, if you have any questions, feel free to ask – I’ll answer to the best of my knowledge.